Robert Herodies posed with his daughter Elizabeth, 5, and son Justin, 8, at his new home in Makakilo. 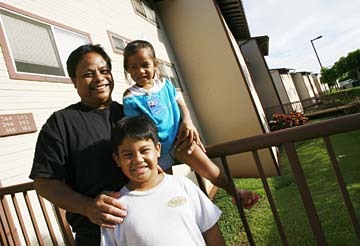 Herodies has bought his first home with the help from the Hawaii Home Ownership Center. Shawn Ardoin, a 35-year-old landscape superintendent for J.W. Marriott Ihilani Resort & Spa, has lived in rental housing since moving to Hawaii five years ago because the cost to buy seemed too prohibitive. After the arrival of an infant son, Ardoin and his wife Heather began pining for the American dream in earnest, but buying property always seemed just beyond their grasp. Then, Ardoin's employer began offering to pay the fee for employees to enroll in a $100 class from the Hawaii HomeOwnership Center, an organization dedicated to helping buyers navigate Hawaii's pricey residential real estate market. "The market seemed too expensive, but we felt that we had nothing to lose by taking advantage of this opportunity," Ardoin said. Marriott's decision to help employees literally get their houses in order has made all the difference for this young couple. They've replaced dreaming about a home in Oahu with an active search for a three-bedroom home in Central Oahu. Buying a home in that area will let Ardoin put down roots in the community where he works, a win for employee and employer. "We all benefit," said Steve Glen, J.W. 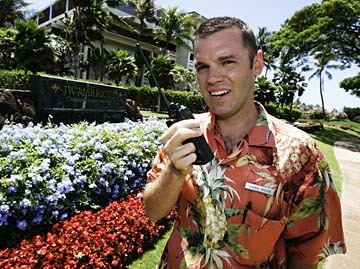 Marriott Ihilani Resort's general manager. "The program helps build loyalty to Marriott as well as enhancing the surrounding community. There are all kinds of studies that talk about the importance of home ownership in terms of reducing crime and building neighborhoods." A home ownership counseling program offered by Ihilani Resort in Ko Olina is helping landscape superintendant Shawn Ardoin, above, to qualify to buy a home with his wife. Many companies find such programs helps them retain hard-to-replace workers. Hawaii's pricey residential sales market combined with its tight labor market has prompted employers to begin offering housing-related perks as part of their benefits packages, said Kendall Hirai, executive director of the Hawaii HomeOwnership Center. Companies like Marriott, Ko Olina Resort & Marina and Dtric Insurance are among a group of employers who have begun offering housing education programs, Hirai said. Ko Olina Resort has taken it a step further by hiring a housing specialist to help workers qualify for new housing projects in West Oahu, Hirai said. And, many Hawaii employers have begun to consider offering employer-assisted housing benefits such as financial assistance with closing costs and down payments, Hirai said. "Housing is definitely top of mind for employers. We are getting more calls from Human Resources departments inquiring about our services," Hirai said. "And lots of them are talking about employer-assisted housing programs." While employer-assisted housing programs aren't the norm in Hawaii, there are plenty of innovative examples on the mainland of employers who have realized that helping workers secure housing pays dividends in reduced training and recruitment costs. Some businesses also have discovered that getting workers established in the community helps retention. Lawmakers across the nation also have supported employer-assisted housing initiatives by offering incentives to companies that help workers buy homes as a way to reduce brain drain and help attract young talent to specific regions. EAH programs have been used to promote regional economic development and leverage private dollars to support housing in states like Illinois, North Carolina, California and New York. Some programs specifically target lower-paid service providers such as teachers, police officers and firefighters. Fannie Mae, the nation's largest purchaser of home mortgages, and the U.S. Department of Housing and Urban Development (HUD) along with such companies as Tyson Foods, Honeywell, Harley-Davidson and GMAC have EAH programs. Some businesses have discovered that getting workers established in the community helps retention. In Hawaii, JW Marriott Ihilani Resort & Spa in Ko Olina offers home-ownership counseling to employees. 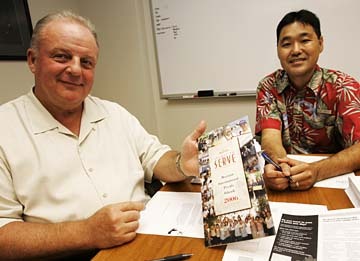 Above, General Manager Steve Glen, left, and Human Resources Manager Jason Furuta show a pamphlet describing the corporation's "Spirit to Serve" program. Ko Olina Resort is proactive about pairing employees with affordable housing because it's the right thing to do, said Mike Nelson, resort vice president. "As we grow as a resort, as a community and as an island we have to insure the availability of housing for all of our people," Nelson said. The resort has long supported the Hawaii HomeOwnership Center and offered employees scholarship for classes, but it stepped up efforts when it hired Kelli Feliciano in June to coordinate affordable housing efforts at Ko Olina and Princeville Resort, he said. "We feel strongly that our employees should have a home," Nelson said. "Market prices are high at the moment, but there is affordable housing coming up and we need to get our employees prepared for it." In the three months since she was hired, Feliciano said she has begun preparing 32 resort employees for homeownership. "I'm currently going through the process myself, so I can relate to the frustrations people are experiencing," Feliciano said, adding that some employees will need financial education in credit clean-up and budgeting before they are ready to take advantage of upcoming affordable housing projects. Oahu-based Aloha Petroleum became a pioneer among private employers in Hawaii's housing benefits arena in August, when they began working with HomeStreet Bank to let workers lower their transaction costs when purchasing or refinancing homes. HomeStreet, which has offered its services to Hawaii members of AFL-CIO-affiliated unions for several years, expanded its services earlier this year and became available to municipalities and private employers. "We all talk about the problem of housing costs. As an employer, we want to find ways to help address that problem," said Bob Maynard, chief executive officer of Aloha Petroleum. The combination of the increased challenges for home ownership in today's housing market and a relatively young workforce who have very little experience in dealing with the complexities in trying to finance the purchase of a home motivated Aloha to create a homebuying program for employees, Maynard said. Through the Hometown Home Loan Program, Aloha Petroleum's 350 employees are eligible to receive significant savings on closing costs and fees for home purchases and refinances, often saving as much as $2,500 at the time of closing. Since August, about a dozen Aloha employees have used the homebuying program, and three or four have already taken out or refinanced home loans, Maynard said. As part of Aloha Petroleum's program with HomeStreet Bank, employees also receive free homebuyer education. In addition, first-time homebuyers have access to several down payment assistance options, such as the HomeStart accelerated savings program. Such programs can amount to thousands of dollars in assistance for eligible borrowers. "The amount most people area able to put away for a down payment doesn't often keep up with the pace of rising home prices," said Maynard. "Through this program, we can help reduce up-front costs for our employees and possibly cut a few months off the saving process." Aloha Petroleum gets the added benefit of attracting and maintaining a great staff despite Oahu's tight labor market, Maynard said. Hawaii companies can't afford to overlook quality-of-life issues for their employees if they want to be able to attract and keep the best and brightest, said Patricia Abad, the human resources director for Marriott's Ko Olina Beach Club, which is one of the first companies on Oahu to offer homebuying education. "If we want to stand out to prospective employees we have to offer something more," Abad said. "Our unemployment rate is the lowest in the state and the human resources environment is really competitive. We continue to attend job fairs, but the number of people at those fairs is dropping." While housing benefits aren't widespread among Hawaii companies, Abad said that one day they could be on par with wages, health and retirement plans. Housing benefits become even more critical for places like Oahu when rents and median home prices are rising, she said. "You can't underestimate the importance of quality of life for employees," Abad said. "Associates want to work for companies that care about them and have shown that they want them to be happy in their personal life." Getting involved in employee housing struggles has become progressively more important for employers who want to thrive in Hawaii, Hirai said. "If they want to keep their work force it's almost mandatory that they get on board," Hirai said. "Geez, there's so much talk from people about moving if they can't afford a house. That's why Vegas is just booming with Hawaii people." » How they work: Classes help workers organize their finances to qualify for home loans; some progams arrange for reduced transaction costs. » Workers win because: Companies pay tuition and may even cut deals on home closing costs and fees. » Employers win because: Employees often buy near where they work, making them more likely to stay with the company.